I had high hopes for the Mini Clubman John Cooper Works. And I will admit that at first, I was disappointed. I like Mini Coopers. I’ve owned two of them now. I had a 2007 R56 that I dumped after monstrous repair bills, only to promptly buy a new 2015 F56 immediately after, because I am an idiot. I parted ways with that car when I moved to New York and have missed it ever since. It’s deceptively quick, great on gas, can fit a truly shocking amount of stuff inside with the seats down, has far more character than a Volkswagen GTI, and best of all, could be parked anywhere. It would have made a great city car. The Clubman is much the same as that, just with two extra sets of doors. It has two in the back and two in the way back forming those famous “barn doors” that open outward. It’s also not that much bigger than your standard Cooper, just enough to give it extra practicality without sacrificing true smallness. So I figured the Clubman done up by John Cooper Works—kind of like Mini’s version of M, or probably more accurately M Sport—would be a mind-blowing visceral thrill ride, a hard edged rollercoaster of speed and noise and easy parking from which my soul would never fully recover. It wasn’t. But I liked it a lot anyway. I will start with the specs because that’s at the root of all this disappointment and, later, acceptance. Power comes from a 2.0-liter turbo inline four putting out 228 horsepower. These days Mini is using all-BMW engines, having done away with the trash fire PSA Peugeot Citroën motors in the last generation cars in the name of warranty claims and actually getting people to keep buying these things. Two-hundred twenty eight horses is not a lot. It’s what a Subaru WRX was putting out 15 years ago. Granted, BMW engines are typically underrated and Mini’s cars don’t carry a lot of mass to move, but with JCW being the “hot” version, you’d think something like 300 HP would be easily doable. That’s not what you get here. The result was a car that wasn’t really any quicker than my Cooper S was. In fact, despite the power difference—228 to my car’s 192—acceleration felt pretty much the exact same, so when you add in the size and weight increase things end up basically equal. That was a letdown. I wanted more from this JCW. I wanted rip-roaring speed, a legitimate hot hatchback experience. Considering our tester cost about $45,000, considerably more than a Ford Focus RS or a Honda Civic Type R, it seems like a real missed opportunity, no? 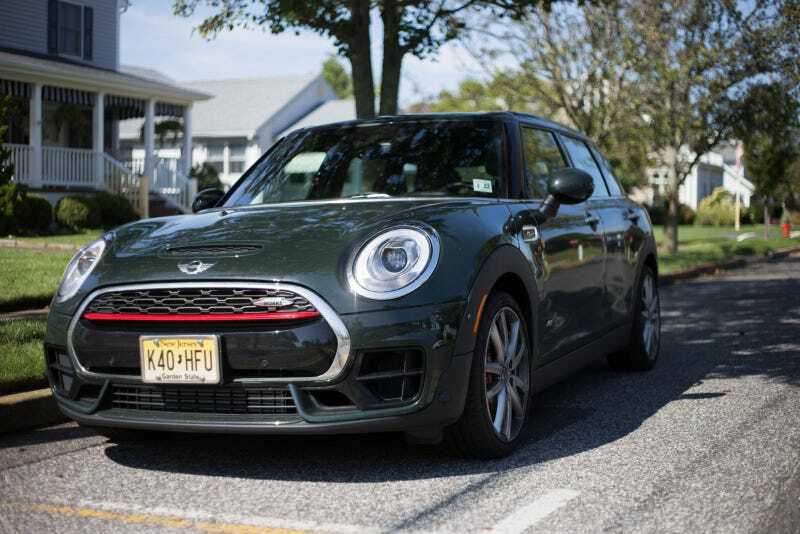 So on much of the first part of this long drive to Watkins Glen, I found myself enjoying most of the things I liked about my Cooper S—tight handling, trunk space, quick acceleration, but feeling like a JCW model should deliver more. I should also note that this JCW was an All4 model, meaning it’s equipped with Mini’s all-wheel drive. Mostly what it did was mitigate the torque steer on hard acceleration that I was used to. I actually like torque steer. It gives front-drive cars more character. So that felt weirdly absent here, but the car remained a competent and handler with tight steering and basically zero body roll. These things can take a corner for sure. The JCW also makes good noises—pops and bangs and cracks under hard acceleration and gear changes, especially in Sport Mode. But even there, it was more muted, more subtle than I would have preferred. It sounds nice but it’s not even in the same galaxy as the Fiat 500 Abarth or, like, a Jaguar F-Type of any sort. You may think the only thing I was cruising for in this Mini was a letdown, that its smiling face would leave me only with sadness. So what did I end up liking about it? What made it win me over? The moment when I had this realization: it’s a wagon. Now you may balk at this because it’s a far cry from the road-devouring American wagons that might have existed in your youth. But it’s true. They even call it that in the UK, where it’s built: there, the Mini Clubman is an estate. It’s long, narrow and short in height with an extended cargo area. It’s a damn wagon. And we have so few of those left in America, especially at this price. This and the Volkswagen Golf Sportwagen and Alltrack are among the few fun wagons that can be had in the sub-luxury segment. Plus, these barn doors are absurdly fun, opening remotely with the key fob or with an optional feature that lets you do it with a gentle kick to the bumper. So it’s a wagon. And a weird, quirky one, with a big grin on its face and a turbo engine and AWD and barn doors. Once that fact dawned on me, I began to forgive the Clubman JCW its other sins, and I saw it in a different light. A more accepting one. How many cars do we really get like this in the U.S.? Not too many. So let’s be glad when things that are funky and not boring come around to brighten our days. And it’s quick enough. The more I drove the car, the more I kept it in Sport Mode and really hammered it around Watkins Glen’s back roads. It moves with plenty of urgency. It’s never blisteringly fast, but it’s still fun. The eight-speed paddle shift automatic was smooth and instant. The quirky interior—though definitely less quirky than when Mini came back to the U.S. initially—has high quality materials, well-bolstered sport seats and a new touch screen version of Mini’s take on iDrive that works superbly. The big panoramic sunroof is lovely too. So in the end I couldn’t help but grin at the Clubman JCW. It’s far from boring even if the performance isn’t exhilarating, but it’s a weird little wagon so I’ll take it. In fact, if I were to buy a new Mini again—and I’d definitely consider it—the Clubman is the bodystyle I’d get for sure. But I’d save myself about $10,000 and just get a Cooper S Clubman, not the JCW, because I don’t think the performance advantage is really good enough to justify that big price tag. You can have nearly as many fun moments with the S as you can with the JCW, and for a lot less. Now, if they finally make that hot hatchback thing, I might be onboard.